Chris hacks, slashes & cleaves his way through the seven deadly sins! The fact that Darksiders III even exists is something of a miracle and says a lot about the passion and dedication of not only the dedicated developers behind the project, but the faith that THQ Nordic put in them when they resurrected the franchise from the corpse of THQ. 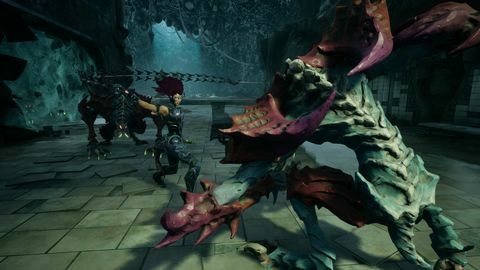 Darksiders III was the planned third entry in the series from original developer Vigil Games which was wholly owned by the prolific publisher THQ. After suffering a series of financial setbacks the publisher filed for bankruptcy in 2012 and it’s three dozen or so studios were either dissolved or sold off to pay back its long list of creditors. This seemed like the end of Darksiders. The remnants of Vigil found work with other studios as well as founding a couple of smaller indie studios. One of those studios was to become Gunfire Games which had been dealing with its own issues under a different name Crytek USA. After a couple of VR titles Gunfire released the remaster of Darksiders II called the Deathinitive Edition in 2015 after the rights to the series had been purchased by Nordic Games. 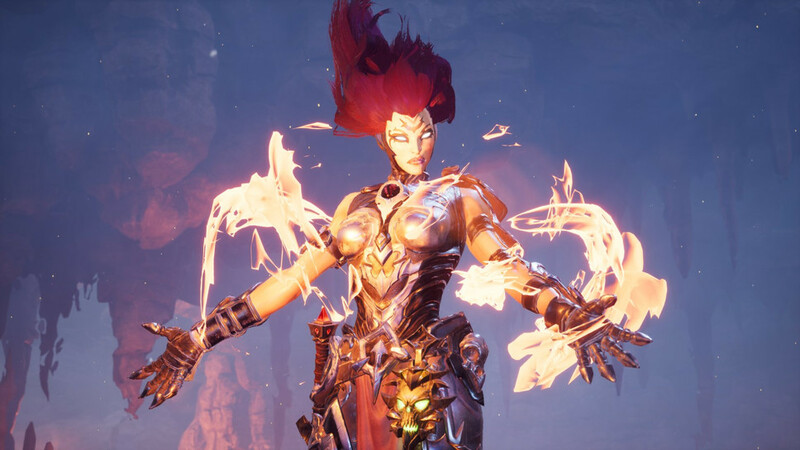 Roll on 2017 when Nordic now known as THQ Nordic announced Darksiders III was being developed by Gunfire officially reviving the series from it seemingly eternal slumber. 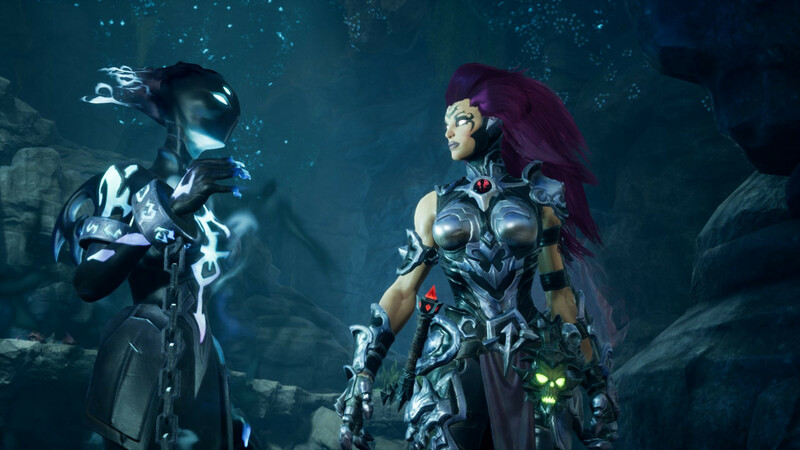 Darksiders III shares a lot of its core DNA with the Vigil releases. Sharing not only the style and tone of the originals but a number of the talented folk who gave us these woefully under-appreciated hack-n-slash gems. If anyone was going to be able to do the series justice, it was going to be Gunfire Games. I for one was extremely interested to see where they could take the series as I adore the grim-dark and overwrought fiction of the Darksiders series. It’s extremely self-serious but also self-aware enough that it is able to carry off its violent earnestness with a cold black stare and a veiled knowing wink. It somehow manages to deliver the preposterousness of its premise in a digestible manner without ever wading into the fetid waters of self-indulgent muscle-flexing high school bro fantasy found in other equally OTT fictions, and yes I am looking at you Warhammer 40K. Falling somewhere between Diablo and He-Man, Darksiders can be a hard sell, especially given it’s superficial resemblance to many tone-deaf, testosterone, and titillation laden fantasies the industry has been attempting to move away from in the past decade or so. Perhaps that is why Darksiders III feels like a game made solely for existing Darksiders fans. This is great for those of us already invested in the ongoing trials of the Horsemen of the Apocalypse, but it is also where things start to get problematic for the game. The two previous entries established the lore and events that Darksiders III takes place in, and introduced us to many of the players in this epic tale of apocalyptic upheaval, divine betrayal and demonic annexation of the mortal realms. The lore here is dense and to anyone not already vested it can seem shambolic and more than a little silly. Not to mention dense and difficult to penetrate. The new protagonist Fury may be making her debut here, but there is a reliance on established lore that is never really explained to the newcomer which will likely make it a difficult, if not completely impassable journey for those new to the series. Which would be a shame as the story here is not only well told but throws in a couple of unexpected and much appreciated turns that puts it well above the usual good vs evil end of the world daftness you might expect from a game as over-the-top as this one. Fury’s quest to capture the Seven Deadly Sins is linear, but it remains entertaining throughout and even manages to make the predictable elements a hell of a lot of fun. While the story and voice acting are up with the best in the series, presentation wise Darksiders III is a bit of a mixed bag on the PS4 Pro. It is not running at a native 4K and it very noticeably using a less than ideal scaling system which adds an odd pixelated shimmer to transparency effects, hair, and object motion blur. Graphically III shares the same striking and cartoonish art style as both previous entries, with an emphasis on bold silhouettes, simple but exaggerated features, and lots of gothic inspired iconography. Sadly, on the PS4 Pro the lower than expected texture detail detracts from the stylistic choices made by the design team and as a result some of the impact is lost. The game can look very dated in places with the geometric detail feeling too simple, with finer details and in world diversity being absent in many places. That being said, I briefly got a chance to see the game running on a high-end PC at true 4K and it looked great. Detailed textures, crisp lines, and no sign of the edge artefacts that marred the PS4 Pro presentation. While I’ve not spent anywhere enough time to make any real assessment of the PC version it does look to be the superior visual experience and played silkily, which is not something I can claim even on the PS4 Pro. It’s mostly solid and runs well for the most part but there were instances throughout the dozen hours or so it took me to complete the game where things were not running as well as I would like. Just as with the somewhat lacking visuals, there is a simplicity with the level design that makes some areas feel a bit unfinished or rushed. This is not a game breaker by any means, but it does take away from the sense of discovery in places and makes some of the levels feel rather mundane compared to those found in the previous games. Thankfully the actual gameplay is a lot more consistent, and just as we had with Darksiders II we have a slight genre shift with the third entry. Where Darksiders I was a linear and very deliberately kinetic hack-n-slash with obvious Zelda influences, Darksiders II went for a more open and free-style action RPG approach with a focus on swift movement and loot collection. 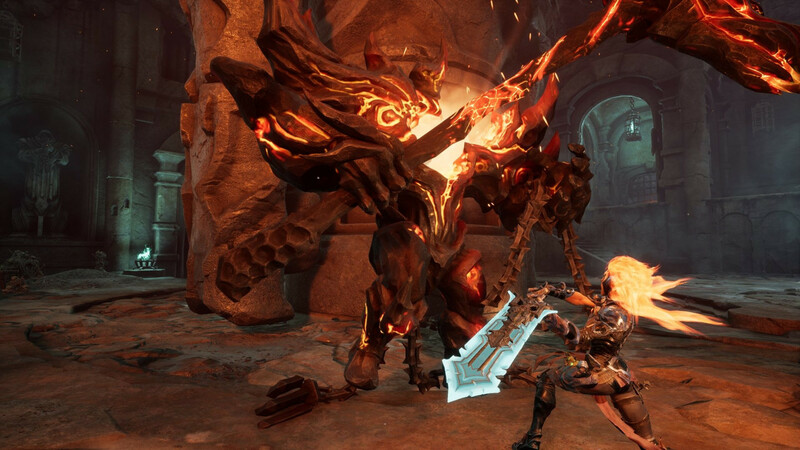 Darksiders III again shakes things up by combining aspects of both games with a heavier emphasis on boss battles. I am not going to directly say where I think this influence stems From, but it is an appreciated change with a nice uptick in difficulty should you wish to play the game at the recommended or higher difficulty levels. 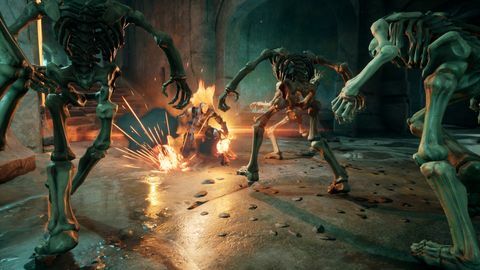 Combat itself is heavily reliant on movement and evasion while also utilising the trigger-controlled lock-on mechanic found in the previous games. To those returning to the series it will feel quite natural and familiar, but given the massive improvements made in third-person melee combat in recent years, it also feels rather dated. Once again returning fans will likely embrace this, but to anyone else, it will likely feel like a massive step backwards mechanically. The lock-on ability is functional but also awkward especially when facing a mob of hard-hitting enemies. The camera, in general, can be unwieldy in these cases often not allowing you to see a foe you want to target, or not being reactive enough to avoid an attack from an enemy you’re not directly facing. Thankfully the ferocity of Fury’s attacks and the range of her bladed whip are usually enough to clear the immediate threats and regain control of the battlefield. Ultimately it feels a little too chaotic at times and even veterans may find the combat a little button-mashy due to combos being harder to pull off in sequence due to the combined camera and target-lock short-comings. Where the game really shines though is the boss fights, and with 7 Deadly Sins to encounter you’ll not only get unique challenges but also get to witness the art and design teams at their very finest. The designs of the Sins are fantastic both in terms of their visual identity and unique combat challenges. The Sins are easily the stars of the show and every one was a delight to fight. While likely not offering the challenge sought by those Borne to fight, for the slightly more casual player I think you’ll find the Soul of the combat experience not only satisfying but rewarding. 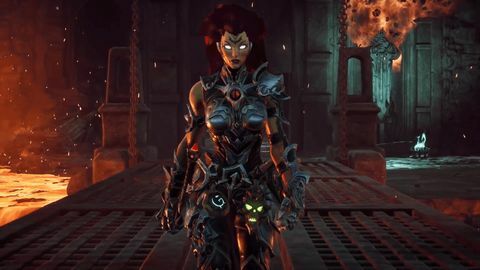 Darksiders III is not quite as captivating as its progenitors and could do with a good polish on console to get it up to snuff, but it is a worthy entry in the series and hopefully successful enough that we can conclude the series with Strife in Darksiders IV. Ups Solid story and fantastic voice acting. Solid 1v1 combat with epic boss battles. Feels like Darksiders. Downs Lacks visual polish in places with some boring level design. Camera and lock-on mechanic problematic when facing multiple enemies. Not friendly to anyone not already a fan of the series.